specialising in bespoke patisseries, celebration and wedding cakes based in West Sussex. specialising in bespoke patisseries, celebration and wedding cakes. 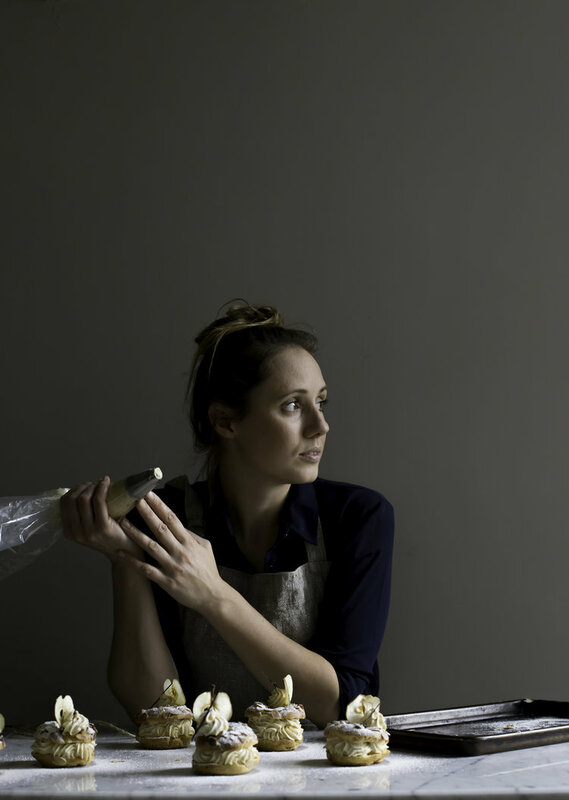 Lucie’s award-winning career as a Pâtissier started 14 years ago at Westminster Kingsway College where she studied a two-year patisserie scholarship. After spending some time at the Grand Hotel in Brighton and then at Jeremy’s Restaurant in Borde Hill, the opportunity arose for Lucie to go to London and join one of the UK’s leading chocolatiers, William Curley. After nearly five years with William, Lucie founded her bakery, Fleur De Sel in April 2012 which today has been re-branded after her own namesake. Lucie won her first award at The Cake Awards in 2013 where she won the ‘Celebration/Novelty’ cake category and has since gone on to be shortlisted for the ’Rising Star Award’ at the Baking Industry Awards 2014 and most recently won the ‘Young British Foodie’ award in the baking category at The YBF Awards in 2015. Today, Lucie works from a stunning country kitchen in Henfield, West Sussex which she plans to convert into a stand-alone production kitchen and cookery school. Lucie’s most popular and favourite products are her Florentines amongst a whole new collection of chocolate wedding cakes, herbaceous celebratory cakes and vegetable inspired desserts. Other projects and collaborations include Nonna's, Bailey's, Country Living and most recently Lucie has been named Guittard Chocolate Brand Ambassador. A collection of classic and modern patisserie inspired by fresh herbs and seasonal ingredients sourced locally where possible, from classical pastry to more exciting marriages of flavours. Carefully handmade and sculpted celebration cakes created with the very best of ingredients to suit every occasion. Beautiful wedding cake designs to inspire; from the wildly modern to romantically traditional with a personal and bespoke service to match.